New. Weekend Log Cabin Quilts for people who don't have time to quilt. 7 product ratings - New. 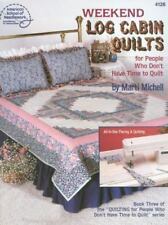 Weekend Log Cabin Quilts for people who don't have time to quilt. Trending at $3.99Trending price is based on prices over last 90 days. Keeping Couponing Real: Couponing for Those Who Don't Have Time to Coupon by J. This page was last updated: 19-Apr 06:39. Number of bids and bid amounts may be slightly out of date. See each listing for international shipping options and costs.